I hope you all had a fabulous weekend! Saturday I ran 15 miles. Oh, I hate being a slow runner more than ANYTHING! My first 5 miles were a little under 10 min miles, but after that I slowed down. I wish I could just keep up that pace! If I don't get any faster by my marathon, it'll be at least a 5 hour marathon, and I was hoping to get under that! Well, I'll keep trying! I work my Pro Compression socks for the first time. I really loved them! The only thing is they were almost impossible to put on and take off! It took forever to do that! I'm wondering if I got the wrong size, or if they're supposed to be that way. I got a Large, which is supposed to be the correct size for my height. Once I got them on, they were fine though. Are they supposed to be so tight? 15 miles done! The weather was perfect, and it was a perfect run! 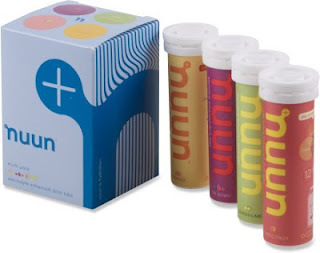 I also bought some Nuun and drank that for the first time during my run. I seriously almost threw up everytime I took a drink. It was disgusting!! I will never drink it again. I guess it's the carbonation or something, but I just couldn't handle it! Which was too bad, I'd heard so much good stuff about it! I hate to throw away 4 tubes of it, does anyone want it? For your Pro Compression socks wearers, are they supposed to be that difficult to put on and take off? I really like Nuun! I dilute it a little more than the directions indicate. Maybe try that. I didn't think about trying that- ok, I will! I don't know how you ran 15 miles! Maybe one day I will work my way up to that! This time last year I had a hard time doing 5k's! I never thought I would get to this point. But you can do ANYTHING you put your mind to! That was a great long run! And don't worry, you're supposed to run long runs slow :) My coach was telling me that she runs them slow, and she just ran a 3:14 marathon! You will have an awesome first marathon because you are so determined! Thanks, girl! Wow, that's encouraging!! I hope my marathon goes that good too! When I ran my marathon in October, I had so much advice from other runners. The main one was to not go out to fast! During that marathon I ran my slowest 5k and half marathon times. I learned so many things running my first marathon and plan to learn from them for my next!! Super excited for you. Thanks, Teresa! I'll definitely have to focus on not going out too fast at first. I'm going to have to go back and read your recap again! Do the compression socks work??? I heard they make recovery after a hard run better...true? They're so expensive, I want to hear results! And don't worry about being slow. I am REALLY slow. Turtle slow. But I never walk! I only wore them during my run. I haven't tried them for recovery yet. But I noticed my calves didn't get sore at all while I was running or after I was done! My quads are still killing me, but my calves are happy as can be! They are expensive. I got these for $30, normally $50! Ugh. I felt the same way the first time I tasted Nuun, but it kind of grew on me after a few tries. Someone gave me to tip to mix a half a tab of two flavors, and sometimes that works better tastewise. The lemon lime, which I thought would be great, totally gagged me. But your comments about it cracked me up because that was exactly my reaction. Gag, what the heck is this stuff that people are so in love with?! Yes, the compression socks are tight! I am addicted to them and don't notice as much now. But sometimes if I'm wearing them overnight, I have to get up and take them off in the middle of the night because my legs get claustrophobic. That's so funny that you had the same reaction to it! I've never heard ANYTHING but positive things, that's why I was so surprised it was so nasty! I guess I'll just have to get used to the socks being tight. I had argyle marks on my legs for a couple hours after taking off the socks! I have ProCompression calf sleeves and I have to say I thought I'd turn myself into a pretzel trying to get them on and off - tightest compression gear I've ever tried! I can only imagine how tight the full socks would be! That's exactly how I felt!! It was pretty much impossible! Wow!! That is amazing!!! I want to get to that place where I'm able to run for long distances. You look fabulous. How do the compression socks work? I've always been curious but am totally ignorant about it. I'm Going to have to try compression socks and see the difference. I'm just rolling with plain old athletic socks. You should try them, Joe. They're great! Hmm, I am of no help. I don't do nuun or compression socks! I do do long runs though, lol. I know your a pro at those long runs!! I'm definitely learning what works and what doesn't! I just tried Nuun over the weekend (talked a little about it in my recent post), and I had mixed reactions. I did dilute it quite a bit in my camelbak, so who knows. As for compression, it is supposed to be very tight. I wear sleeves in my calves to aid my barefoot running, and I love the results. They are flippin' tough to get off! Maybe that would make a difference if I diluted it. It is so strong. Good to hear about the socks, I thought maybe I just got the wrong size! I def think compression socks are supposed to be super tight like that and hard to get on. I only like certain flavors of NUNN like fruit punch, but that is how I am with most drinks. ha! Yea, I guess they are supposed to be. I'm sure the flavors wouldn't be so bad, if it wasn't for the carbonation! That sounds like great advice from your coach!I actually don't do track or speed work. Maybe that's what I need to start doing to get faster! Great job on your 15 mile run! I felt the same way when I tried Nuun and I haven't been able to bring myself to try it again on a run. I sampled a couple different flavors at a race expo that were much better than the flavor I originally tried but still not my favorite. Thanks, Suz! I tried 3 different flavors, and still just could not get into it! 1st marathon goal should just be to finish. :) Most courses have a 6-hour limit, I think, so don't be too hard on yourself for being a slower runner. Getting faster will come with time - just continue focusing on endurance for now. That's my 2-cents anyway. I've never tried compression socks or Nuun. I do think that the socks are supposed to be tight, though. I think that's great 2-cents! I'm feeling great about my endurance. I'll try not to worry as much about my speed! I love love love my compression socks! I do too! I think this could become an addiction! !